The Apple iPhone takes the cake for being one of the most advanced smartphones of recent times. It features an amazing camera that lets you capture some great pictures and incorporates high-quality and powerful components for a superlative performance. As for the design, it pleases anyone who’s looking for a sleek and stylish phone. 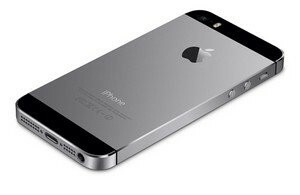 POWERFUL PROCESSOR The Apple iPhone is equipped with a powerful A7 processor that is based on the 64-bit architecture. The A7 chip has double the capacity of the A6 chip, which means you will be able to enjoy multimedia games with complete 3D effects. This device also delivers a faster CPU performance and enables you to multitask by launching more than a couple of applications at the same time. MOTION DETECTING COPROCESSOR The iPhone 5S has a motion detecting coprocessor, the M7 coprocessor, that senses motion-oriented data. So when you're consulting Maps while travelling or evaluating your performance on the treadmill with the aid of workout applications, the co-processor automatically starts functioning and takes the load off the main processor. It detects when you park the car and start walking towards your destination and automatically switches from driving to walking while you are navigating. What’s more, the coprocessor recognises if the device has not been picked up for a while and reduces network usage to save on battery. HIGH RESOLUTION TOUCHSCREEN The Apple smartphone features a 4-inch Retina multi-touch screen that gives you an enhanced visual experience. It has a high screen resolution of 1136 x 640 pixels and colour depth of 16M. The contrast ratio of the display is 800:1 and it has an oleophobic coating to withstand fingerprints. These features bring your photos, movies and videos to life and displays them with utmost clarity. EXTREMELY STYLISH What makes this advanced smartphone from Apple distinct from other phones is its precision construction mark in a sleek glass and metal golden colour aluminium casing. A sapphire crystal is fitted on the home button as well as near the iSight camera for protecting it. The sleek and light device measures 7.6mm in thickness and is great for one-handed use. You can choose from stunning shades like gold, silver and space grey. KEEP MEMORIES FRESH WITH ISIGHT The iPhone 5S comes with two superior cameras. The primary camera with a resolution of 8MP features the iSight technology that enables you to capture crystal clear snaps. Its burst mode feature lets you click 10 snapshots in one second and its sensor is relatively large to allow more light to pass through it. Both the white LED and amber LED deployed in the device, adjust the flash intensity and colour temperature of your picture for optimum results. You can capture panoramic shots and square pictures and even enhance your images with the help of multiple filters available in the phone. It is possible to zoom while recording a video and capture HD videos at the rate of 120 frames per second. Auto image stabilisation is another one of this iPhone’s benefits, which makes sure your images have less noise. This feature also does away with the blurring effect caused due to hand and camera shake. ADVANCED SECURITY FEATURES This smartphone has an exclusive fingerprint identity sensor called Touch ID, that can recognize the impression of your fingers when they are placed on the home button. This smartphone by Apple will only unlock when you place your finger on the sensor. This technology ensures that nobody else is able to use the device. In case you want anyone else to have access to the phone, you can easily save their fingerprints on it as well. It is also possible to save your fingerprint as the password for iTunes and Apple App Store, making it safe for you to purchase applications and other digital content from the app store. FACETIME FOR VIDEO CALLING Making FaceTime video calls from your phone to any other Apple iPhone is a breeze with the front-facing FaceTime camera. It lets you keep in touch with your friends and loved ones even if they are miles apart from you. The webcam of the iPhone 5S has larger pixels as well as a backside illumination sensor so that poor lighting conditions do not deter your web conferencing calls. It is possible to make audio-only FaceTime calls too. INTUITIVE AND USER-FRIENDLY OS The Apple phone in question runs on the iOS 7 operating system, which is so far the most advanced OS offered by Apple. It makes the smartphone very versatile as you can comfortably navigate between applications and download innumerable apps from the Apple App Store. It is designed to go perfectly with the A7 chipset, the new and improved iSight camera as well as the Touch ID fingerprint sensor. It brings an intuitive and user-friendly interface and can be updated to the later versions as soon as they are out.